– a pair of pretty lacy legwarmers to be enjoyed with all of the above! 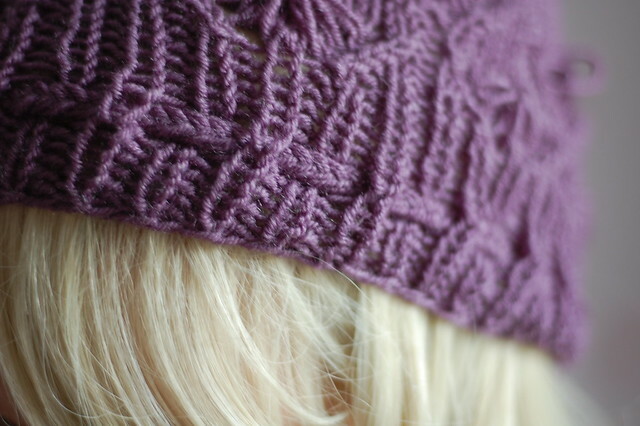 Despite the weather’s worst intentions, I managed to take a few passable shots of my latest pattern. Expect an update when the sun shows up! Pale pink with dark green is my favourite colour combination at the moment. It’s such a nice balance of tones, and the girly pink tempered by the earthy green just puts me in mind of roses. 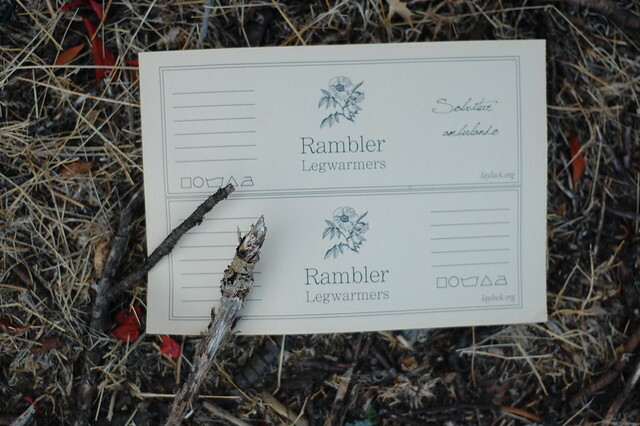 As does the lace pattern on the Rambler Legwarmers. I’m not sure why, exactly. I suppose the curves do resemble the shape of a rose-head, and the diamonds in the centre do look like leaves or petals, growing up out of the twigs of ribbing, but it’s all quite subtle. I’ve had need of these legwarmers with all the gloom and sog recently. I love legwarmers, especially inside wellies (“rain boots” to American readers, though why you would want to call something “rain boots” when you can call them “wellingtonians” is beyond me! ), or scrunched up at the ankle with cute high-heel boots. Because I’m obsessed with versatility, these legwarmers can be worn with the ribbing at the front, for a plainer look, or with the lace at the front, for a little more prettiness. 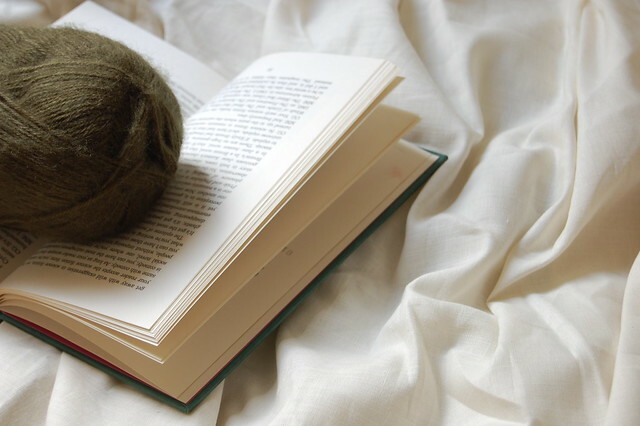 I wanted them to be very simple & quick, with a lace stitch that you can memorise in a pinch, so that you can finish a pair in a weekend, and ohh, just snuggle up on the couch to read. If you’re subscribed to my newsletter, you’ve already seen the 2 wrappers that accompany the pattern. Especially handy if you want to give your legwarmers as gifts, but also if you just want to keep them tidy & remember how you’re supposed to launder them. Once again, here’s a great reference for care symbols. As usual, instructions are both written & charted. I’ve also given advice on knitting eyelets at the top of the legwarmers for ribbon or elastic, and also some pointers on adjusting the fit. 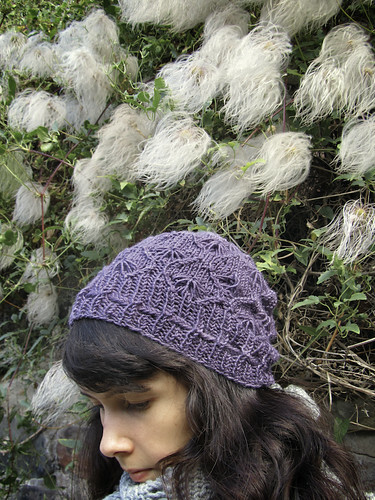 YARN: 1 ball Feza Angora [100gr; 50% mohair / 50% acrylic; 400m / 440yds] or approx. 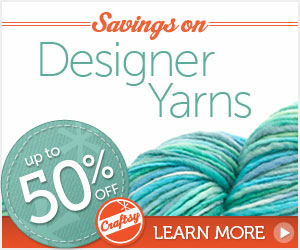 400m / 440yds of 4-ply yarn. NEEDLES: 3mm (US 3) double pointed needles, or size to get gauge. GAUGE: Ribbing: 26sts / 30 rows over 10cm/4in in unstretched ribbing. 1 pattern repeat (8 rounds / 12 sts) is 4cm/1.5in x 2.5cm/1in unstetched. SIZE: Finished size will be 55cm/ 21.5in in length, 20cm/8in in circumference, unstretched. To fit calves up to 45cm/18in around. 11th October, 2011 // Arms & Legs, Downloads, Roundelay // tags: autumn, free, lace, legwarmers, printables, rose. Many thanks to my Technical Editor, Akshata Dhareshwar! Cornflower is my idea of a carefree hat; a hat you pull on without even thinking as you head out to do a spot of gardening. 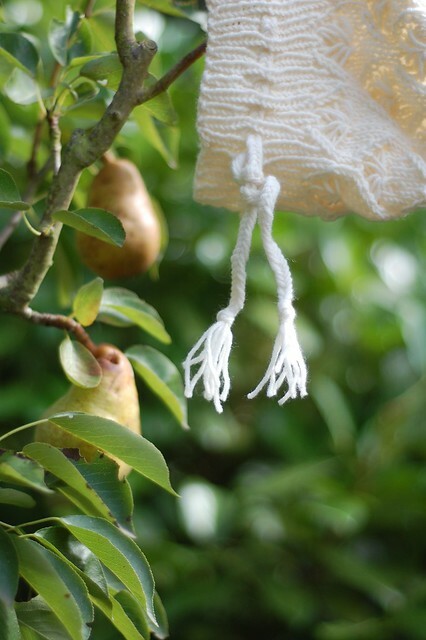 Or perhaps you keep it hanging on a nail in the greenhouse, for convenience. And if your ribbing starts to sag a little because you’ve worn it so much, well, just tie it up a bit tighter! When you get back inside you can sit down with a well-earned cup of Lady Grey. It has cornflowers in it, you know! Cornflower is knit from the brim up in a deceptively simple & fun stitch pattern that is a combination of eyelets and elongated stitches (watch the video to see for yourself). 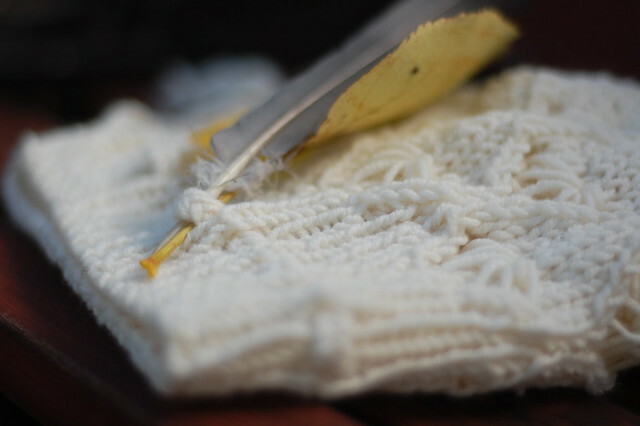 The ribbing transitions neatly into the main stitch pattern which decreases into a very satisfyingly symmetrical crown. 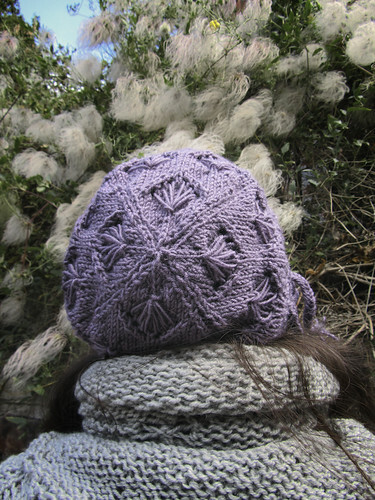 The tie is braided herringbone-style and threaded through the yarn over holes in the brim. 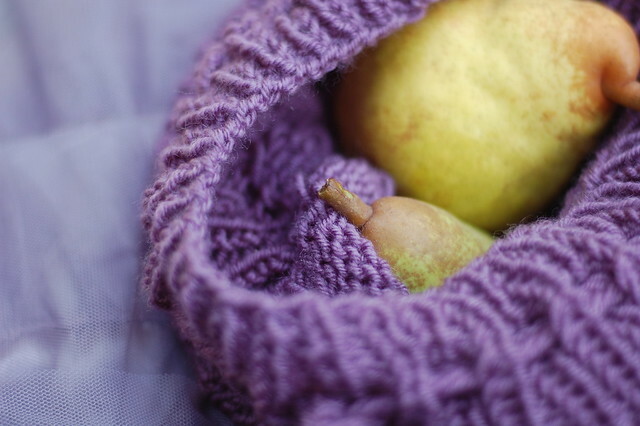 Like all good hats, it will knit up in a day. I can use the braided tie as a bracelet, to stop a door slamming, to tie up drooping plants, or for various other stringy purposes. It gives people behind me in a queue something pretty to ponder. 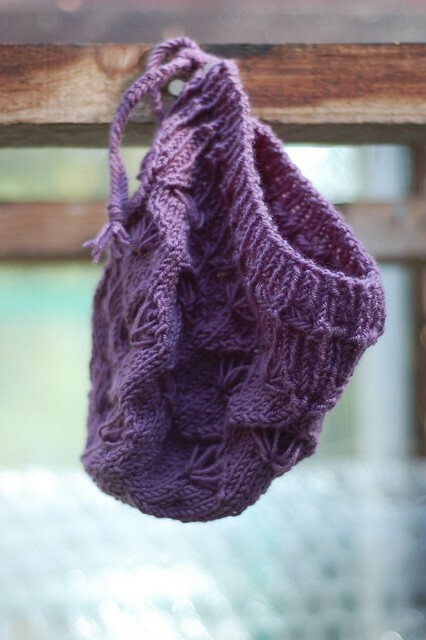 I can use it as a pouch with a drawstring. I can stick all manner of found objects into the tie. It’s lacy & textured at the same time. On a side note, if you like lists like this, you really should read the 101 Reasons Why I Love Knitting. ‣ 1 ball Alize Cashmira [100gr; 100% wool; 300m / 328yds] or approx. 170m / 186yds of DK-weight yarn (including yarn needed for braided tie). ‣ or size to get gauge. ‣ 16sts / 20 rows over 10cm/4in in blocked ribbing. ‣ 1 pattern repeat (18 rounds / 20 sts) is 7cm/2.75in x 7cm/2.75in when stretched. ‣ 21cm/8.25in from cast-on edge to tip of crown. ‣ The pattern includes instructions both for altering gauge for a tighter-fitting brim, and for making the hat slouchier. 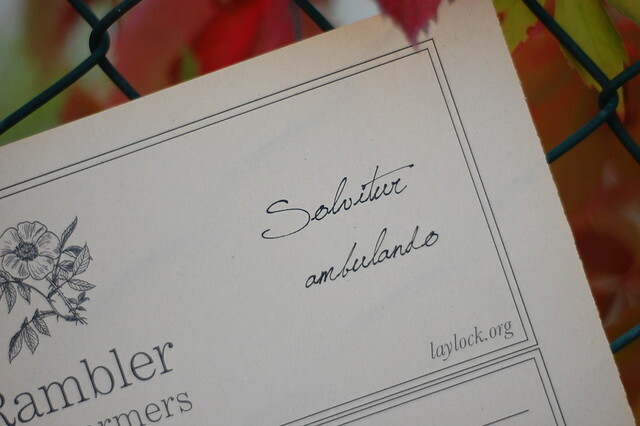 21st September, 2011 // 5 O'Clock, Hats, Roundelay // tags: autumn, cornflower, hat, lace, spring. 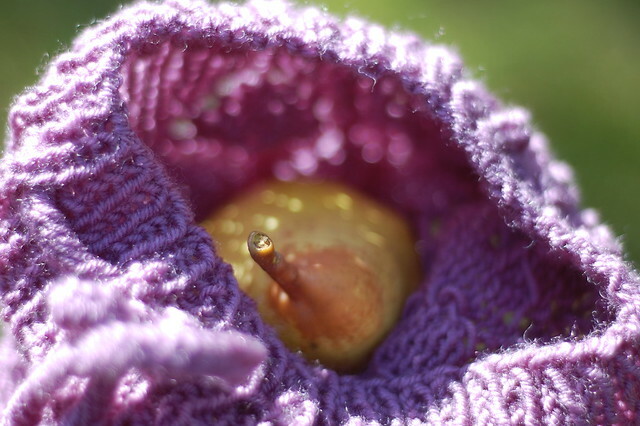 I think the work you put into your knitting will reward you richly, not just in the beauty of the final piece, but in more profound ways, just like the pretty spring blossoms bear fruit in autumn. That’s the story I tried to tell in this video. Also, of course, that a hat with a drawstring is an excellent place to keep your lunch, perhaps Paddington-style marmalade sandwiches? Many thanks to Granddad’s orchard, Grandma’s greenhouse, Dad’s camera, providential butterflies, birdsong and the D chord. 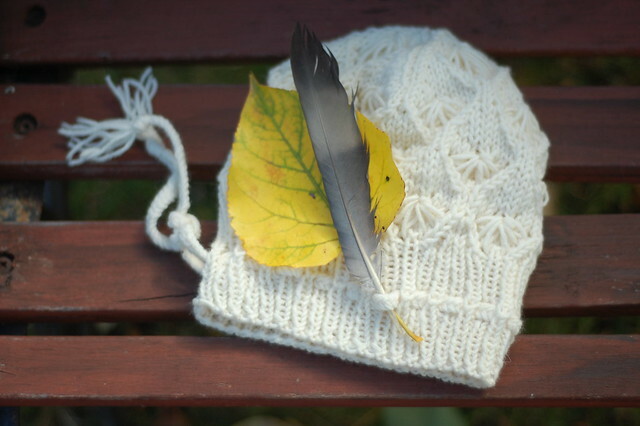 12th September, 2011 // Inspiration, Roundelay // tags: autumn, hat, video.